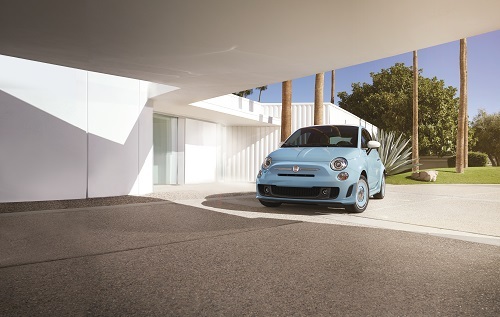 The Fiat 500 reveals a retro styling package that’s sure to stand out on the road. The Fiat 500 1957 Edition transforms the Fiat 500 Lounge model to reflect the undeniable style of the original 1957 Nuova Cinquecento model. A standard 1.4-liter MultiAir Turbo engine delivers an additional 34 standard horsepower than its predecessor — 135 horsepower and 150 lb-ft of torque. A five-speed manual transmission is standard and a six-speed automatic transmission is available. Whether you choose the cabrio or hatchback body style for the Fiat 500 1957 Edition, you will appreciate the throwback, classic features such as a retro fascia with vintage Fiat badging and bright inserts and a choice of three 16-inch wheel options of blue, green, and white. Retro Ivory door-trim planes and white exterior mirrors contribute to the stunning look of the car. A black soft top is featured on the cabrio model while the hatchback model is defined by two-toned paint with a white roof. Exterior color options include Retro Light Blue, White and Light Green. The interior of the Fiat 500 1957 Edition is well-appointed with ivory door-trim panels, an Avorio/Marrone leather-wrapped steering wheel, leather seats, and vertically crossing accent stitching on the seat cushions and seatbacks.